It takes guts to serve the military. POWER AND GUTS: Only available to the U.S. Department of Defense, Evinrude’s Multi-Fuel Engine (MFE) has the power and guts to take on the toughest assignments. The MFE is the first outboard engine capable of running on multiple fuel types including standard gasoline, kerosene, and even jet fuel. 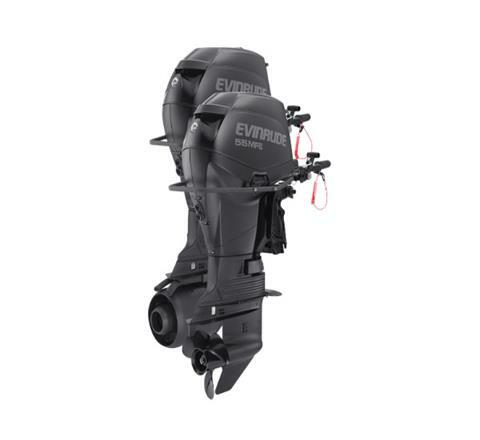 E-TEC TECHNOLOGY: While not designated as Evinrude E-TEC engines, the E-TEC technology is incorporated throughout the motor, including E-TEC injectors, the fuel system and an onboard computer. The E-TEC technology that the government depends on is available for civilian-use with the other Evinrude E-TEC engine horsepower ranges. Additional MFE innovations include special cylinder sleeve oiling, modified deflector pins and unique engine mapping systems. CREATED FOR STEALTH: The MFE boasts minimal engine noise and low exhaust emissions. The multi-fuel outboard and its boat can be launched from a submerged submarine or airdropped from a helicopter or C-130 Hercules cargo plane. MILITARY TRANSPORT: The Evinrude Multi Fuel Engine (MFE) allows the military to transport outboards via aircraft or ships without having to deal with volatile gasoline fumes. That's important because gasoline is forbidden aboard U.S. Navy ships (the US Department of Defense Common Fuels Initiative).